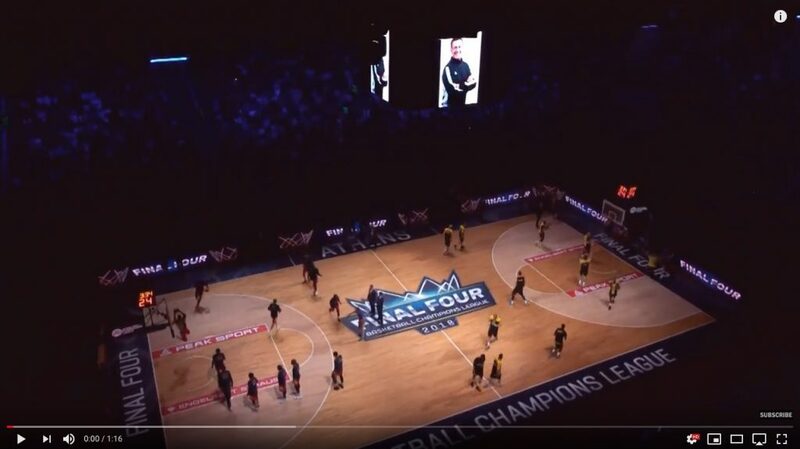 In this latest case study, sports consultant, Geoff Wilson, analyses the Basketball Champions League and delves into the reasons for its exponential growth. 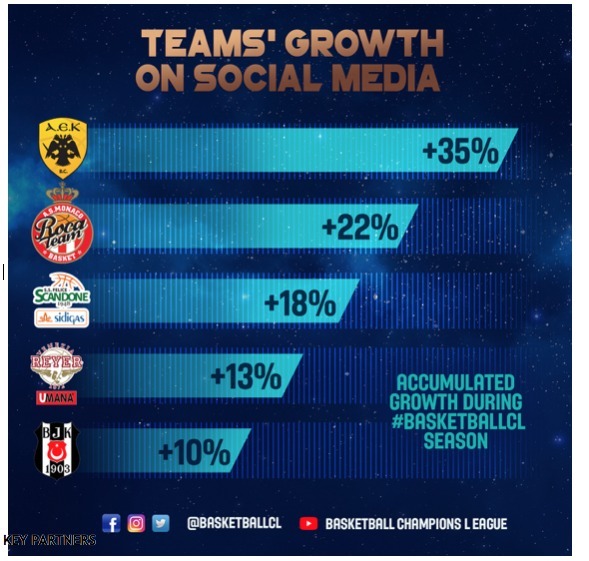 The Basketball Champions League (BCL) was created in 2016 and after a very successful first season, the competition reaffirmed its impressive digital growth during the second season, running from October 2017 to May 2018. The basketball scenery is over excessively filled with events in Europe, with four club competitions running concurrently. Despite being the new kid on the block, the Basketball Champions League is growing fast, very fast. The league that was created in May 2016 embraced digital since the very beginning, used social-media as its main channel of communication, and set its digital landscape as a top priority. This has led the competition to become the number one European club competition on Facebook in only one year. Becoming without any doubt the fastest growing sport properties in Europe. There is much to savour from the 2017-18 Basketball Champions League, as the competition gave the fans plenty of inspirational moments to discuss. In all, the second season registered 44 million video views and reached more than 120 million people through social media over the course of 2017-18. In other terms, compared to its first season, the Basketball Champions League grew its digital fanbase by 115%, its video consumption by 57%, its social-media reach by 145%, and its engagement (interactions, reactions, likes, comments, shares) by 59%. Staggering. The Final Four itself (which took place in May 2018 in Athens) has generated a ton of excitement, triggering a 94% increase in video views compared to last season’s Final Four in Tenerife, and reaching 18,800,000 people. We are both delighted and thrilled to see the competition confirming its first season’s massive success on social media. We have now close to 2,000,000 followers of the Basketball Champions League on social media. The digital output of the first two seasons is impressive, and we are proud of such an achievement. The Basketball Champions League does not exist for its own sake but as part of a broader strategy to grow basketball across Europe. It is based on established sporting principles of inclusion by merit rather than commercial brand value and is an integral part of the new European basketball ecosystem. We are extremely pleased to see that the first two seasons of the competition were appreciated by the fans and the participating teams. Eventually, championsleague.basketball generated more than 2,300,000 visits in the course of the 2017-18 campaign with fans eager to read features and interviews about star players. Since the first day, we have established a clear and strong commitment towards digital. We are a brand-new competition, and we believe that investing in digital is the way to develop, but also to be in line with current trends. Our communication strategy has many aspects, but digital plays a key role. We put the emphasis on fan activation and engagement. The digital era we are currently living encourages us to be flexible and to adapt our actions on a daily basis, by following closely the main actors, the teams and their players, but also by listening to our fans, to the digital trends. Clubs and players are and remain our first and prior focus and we keep them at the centre of our attention. I think the whole tournament is really well put together, the advertisement for the competition is amazing, and the social media is the best from all basketball competitions. The numbers of fans following the Basketball Champions League Facebook page impressively rose thanks to various digital activation. The sole creation of clubs’ personalised GIFs on the GIPHY platform was used more than 5,000,000 times. The Basketball Champions League is hands down the best league as far as promoting their brand, the teams and the players that compete in their competition. As players it’s a great feeling to be showcased for having a great game through their social media channels and for teams to battle for a top 10 position in the BCL Power Rankings made it that much competitive! After 2 years of existence it’s clear that the BCL will do nothing but grow and get better for years to come. The teams participating in the Basketball Champions League are also clearly benefitting from the digital exposure of the competition. The following graphic indicates the best social media growth among participating teams during last season. To achieve such results, many key partnerships have been concluded to offer a top-level product to the fans. From an 8-camera TV production on all games (Perform), signage (CSM Live), branding (The Works) to commercial and marketing aspects (Infront), market leaders have been involved and greatly helped to promote the competition. On the digital side, a key partnership has been taken with WSC Sports Technologies, also partner of the NBA, MLS and US Open, to propose automated video highlights’ solutions to the fans, clubs and players. 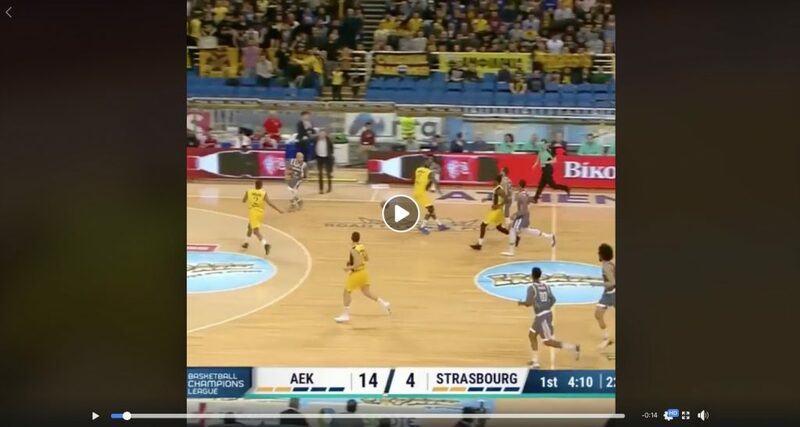 This feature has helped the Basketball Champions League to increase – and speed up the process of – production of digital content, with a focus on videos. Not only, diverse digital graphic agencies are also partners, to complete the visual offer of services. The development of the Basketball Champions League has been accelerated thanks to the close relation with FIBA, the International Basketball Federation, owning 50% of the competition (together with 11 European leagues) and hosting it in its headquarters in Geneva, Switzerland. The Basketball Champions League has therefore been able to benefit from this knowledge sharing, FIBA being among the most digitally active and forward-looking international sport organisations, as highlighted by the “2017 Olympic Sports Social Media Ranking” established by Burson-Marsteller/TSE Consulting in December 2017. 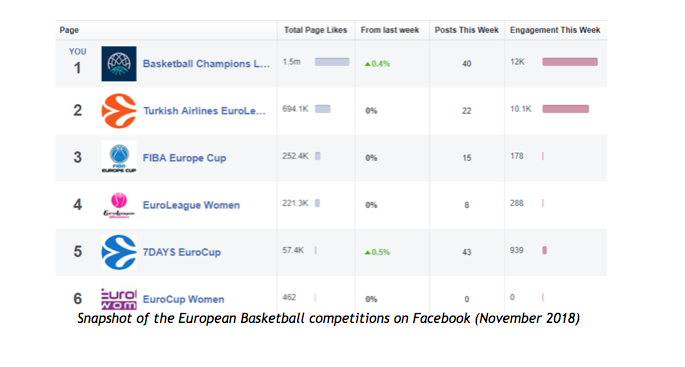 Facebook has been considered the most active and growth-centric platform by the Basketball Champions League. That said, efforts are being done cross-platforms, using diverse tools and target audiences according to each platform. This strategy has allowed the Basketball Champions League to digitally outmatch concurrent competitions, some being on the market for 20+ years. 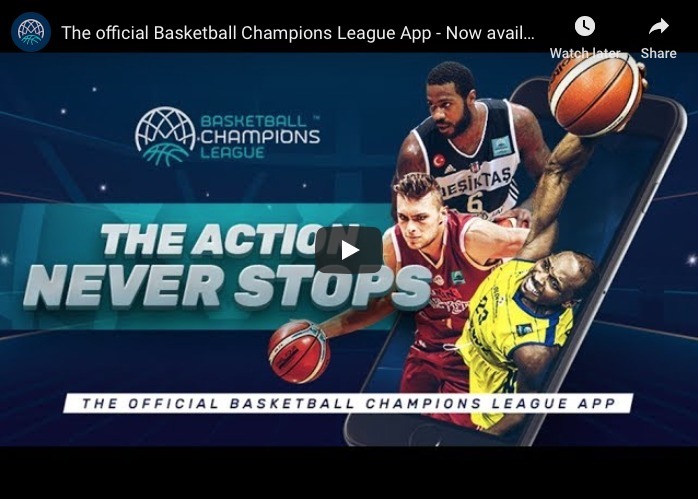 For the 2017-18 season of the competition, the Basketball Champions League has launched its own app which is has promising results and drives some important part of the digital traffic. Adopt a flexible strategy, fan- and player-centred. As FIBA is doing in its own social media strategy, the Basketball Champions League put the fans at the heart of its digital activities. Being disruptive, the aim is to keep an extremely flexible approach, adapting to the needs and interests of the fans, and always keeping the focus on the main actors, the players, continuously putting them in the light, at the centre of the attention. Be tech- and trend-savvy. Basketball Champions League has partnered with market-leaders to propose a top-level fan experience, notably on the digital side. 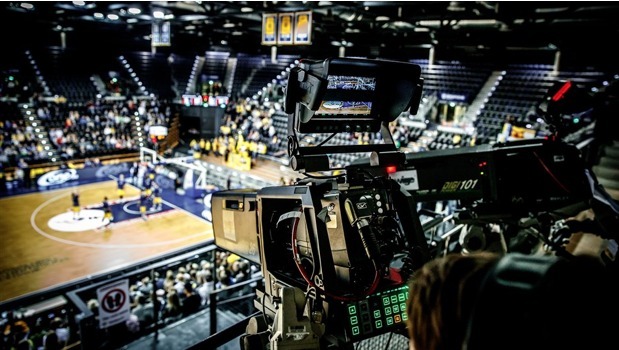 They use a balanced offer between first-class TV production and digital livestreams (on platforms such as Livebasketball.tv and/or on the main social media channels). Build & benefit from the network of stakeholders. Being hosted by FIBA, one of the most digitally advanced and active sport federations, the Basketball Champions League has benefitted from their digital knowledge and best practices. Developing in parallel the social media footprint of its own channels and participating in the increase of the digital exposure of their main actors, clubs and players, the Basketball Champions League is offering a win-win solution that greatly participates in their digital success. Video is key. Video content is currently the key digital asset for any modern sport properties. It allows the content to be easily accessible, consumable, visible, engageable by everyone. Short video content is also easily shareable by all stakeholders (fans, clubs, players, media, etc.). The Basketball Champions League is an innovative 50-50 joint partnership between FIBA and 11 top European leagues. It is a fair competition based on sporting principles with teams qualifying through national leagues. It is a truly European club competition with 32 countries. For further information about the Basketball Champions League, visit championsleague.basketball or follow us on facebook.com/basketballCL, twitter.com/basketballCL, instagram.com/basketballCL and youtube.com/basketballCL.